Happy Tuesday! I’ve got a quick post today. This past Saturday I ran the Baltimore Marathon and I spent the rest of the weekend relaxing and recovering. I’ll be back in the kitchen soon, but for now I wanted to share the only thing I managed to cook on Sunday. Because cooking generally involves standing on your legs… and I did not want to do much of that. I’m incredibly excited about this spice blend, because it’s probably one of the easiest I’ve ever made. I know that sounds ridiculous, because how hard can it be to mix a bunch of spices together? Well, this Persian-inspired shortcut baharat takes it up a laziness notch because it requires only one measuring spoon to make! I got back to the kitchen and realized I didn’t write the amounts of any spices. Rather than do the responsible thing, which would be to do further research and come up with more exact proportions for the different spices, I grabbed a quarter teaspoon measure and spooned out the exact same amount of every spice. It smelled great! We slathered it onto delicata squash along with some smashed garlic and olive oil. 30 minutes later, the kitchen smelled like heaven. As we dug into that delicious squash, I realized that this spice blend was a keeper! Luckily, I already had the spices written down :). Sunday I prepared it again in a bigger batch, and I can tell you that it was no fluke! This shortcut baharat may not be authentic, but it is easy as all get-out and it tastes amazing. It’s a warm, complex spice blend with some savory and bitter undertones, making it the perfect pairing for sweet winter produce like squash, sweet potatoes, carrots, and apples. It also has, in my mind, a great amount of kick. If you’re sensitive to spice you can always dial that part down. In the coming days I’ll be sharing a specific recipe for putting this fantastic shortcut baharat to work, but in the meantime, pair it with your favorite autumn/winter veggies to make them sing! 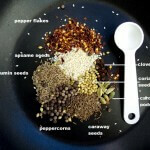 Make a robustly flavored baharat spice blend with only one measuring spoon using this simple formula. 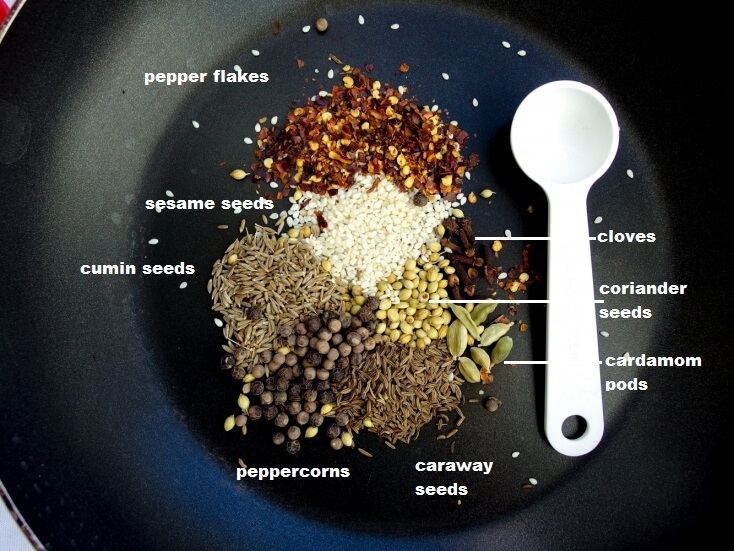 In a small, nonstick skillet over medium heat, add all of the whole spices (peppercorns through caraway seeds, cardamom seeds, and cloves). Toast the spices, stirring frequently, until they become fragrant and the lighter ones start to darken slightly, 2-3 minutes. 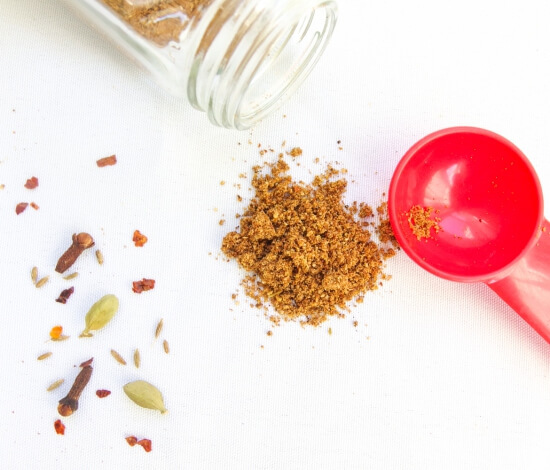 Grind the toasted spices together with the allspice, nutmeg, and (optional) saffron using the kitchen implement of your choice (coffee or spice grinder, mortar and pestle, blender, etc.). Store in an airtight container; will keep at room temperature for about a month, or longer in the refrigerator or freezer. Grinding whole spices releases their oils, which decay over time, and cold temperature can slow this process. 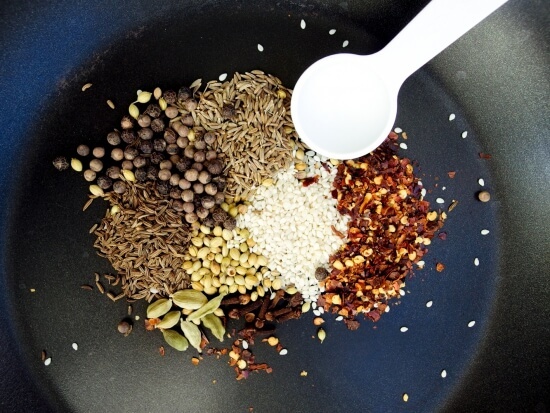 I love custom spice blends – and this one sounds so versatile! Can’t wait for your race recap!